If you missed Furi, it was an indie title by The Game Bakers ported across to the Switch eShop last year. It's inspired by Japanese games such as No More Heroes, Metal Gear Solid and God Hand and combines the gameplay of a shoot 'em up and beat 'em up. You take control of a nameless stranger who must fight for freedom from prison. One year after the Switch launch, the developer has now released a new update for the game. The 'Freedom Update' includes an Invincible Mode, the elusive boss Bernard and Speedrun in Furier. A new control scheme has also been added. In celebration, a new trailer has been uploaded and the game is currently on sale on the Switch eShop. 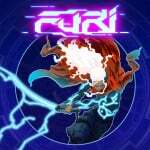 For more information about Furi, read our review, where we awarded it seven out of ten stars and said it was a deceptively clever anime-influenced game. Have you tried out this update yet? Are you planning to buy this game while it's on sale? Tell us down in the comments. I really want to play this, but the switch e shop says im too young. Loved this game! Don't have time to check out new update but very cool. Did they fix the frame rate problems it had at launch? It was the only thing utting me off. Is that music in the trailer from the game? Because if so I know what game I will be purchasing later today. I've been stuck at one boss battle for months and my desire to push though is tending towards diminishing returns. (So many other games that you can just play and have fun). So the ability to skip part of the fight might get me to play through the rest of the game, because the visuals and music are amazing. Good stuff. Definitely picking this game up. Which one is giving you trouble? @SBandy yes, it is. The Toxic Avenger - make this right. Best Soundtrack together with NeuroVoider! ... and the game is great too. I'm still at the 8th guardian. A reason to pick it up and play again real quick. @PBandSmelly Then you need to change your birth year on your account I believe. Forgot about this game. Added to GameFly queue... I'll give it a whirl. This game is amazing in my opinion. One of the most intense and enjoyable games I've ever played, with my only complaint being that it's too short. I suppose your enjoyment of the game depends on whether or not you like tough boss battles though, since that's really the whole game. Just got the Collector's Edition still virgin in the packing.